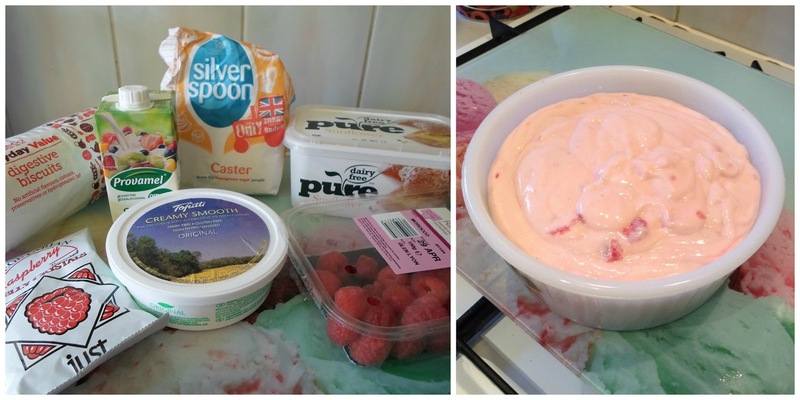 I'd thought I'd share with you my dairy free cheesecake disaster. I tried adapting a recipe and it when a bit wrong. I'm guessing not enough jelly as it did not set. I also halved the quantities because I did not want to make 12 individual portions. Even though I ended up with raspberry cream on biscuits it was still very tasty. This is my second attempt at trying to perfect the art of dairy free cheesecake. The only other recipe I have attempted was for a Raw Peanut Butter & Chocolate Cheesecake. This time round I was hoping to get as close to the real thing as possible but it did not go according to plan. You can get vegetarian gelatine, not flavoured like the actual jelly stuff. Maybe if you bought some of that and added it you'd get more of a set without changing the flavour too much? If not maybe a baked one would work? Yes I know veggie gelatine and that's probably all it would take to make it set or more jelly. I never did like baked cheesecake as a child so don't want to go down that route plus not sure dairy free cheese would hold up in the oven so then you have to start experimenting with silken tofu.